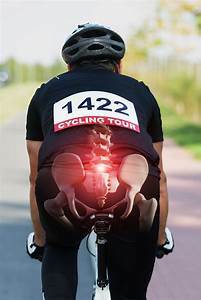 While cycling, lower back is constantly bent forward, hence, the lower back muscles as well as remaining stabilising muscles of the core must work extremely hard to provide a solid base for the cycler, maintain as neutral spinal position as possible and take off as much pressure from the vertebrae as possible. Therefore, if a cyclist has an insufficient core strength, it can result in many problems. During pedalling, core is the main area that keep a cyclist straight preventing one from swinging from side to side and ensuring that propulsion is coming from the legs. If core muscles are weak, cyclist might start swinging and relying on the momentum of the swing to help one generate as much power as needed to carry on propelling forward. Also, constant swinging will put too much strain on the vertebrae dramatically increasing risk in developing a serious spine injury. Moreover, muscles behave as shock absorbers minimising the amount of forces which are going through the vertebrae. If core muscles are weak, most of the absorption must be performed by the intervertebral disks and with time, if strengthening is neglected, can result in disc hernias, protrusions or a disk dehydration which will require long physical rehabilitation to recover. Simply implementing 20 minutes of core strengthening 3 times per week will help you to minimise the possibility in developing any of the conditions mentioned above as well as increase your performance!